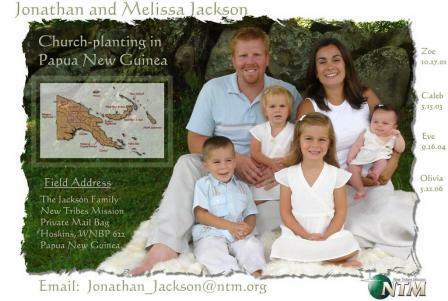 The July Jackson Building Team From NH!! Hi there..I'm Mary Winslow. I'm going to post some photos of our building team from NH. 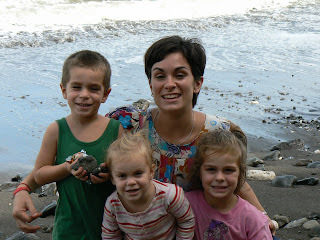 Melissa asked if I would update the blog as they aren't able to at this time!! Here is a picture of our crew of 5 that went: From left to right is: Herb Jackson (Yes..Jonathan's Dad), Christian Thorn, Jim Thorn, Glenn Winslow and Mary Winslow. 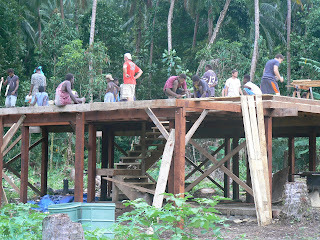 We spent two full weeks in PNG helping to build their home!! Enjoy the photos below!! 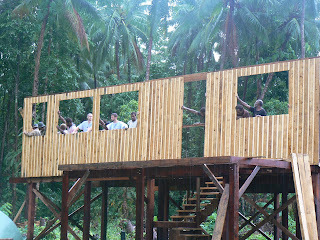 This is the deck that Micah and Jonathan got on before the team arrived!! Great work!! 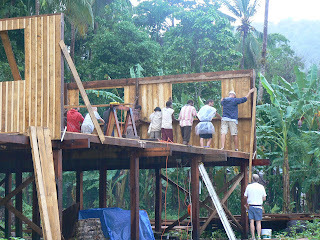 Here are the walls going up one by one!! When Eve saw this first wall go up she yelled, "That's a my house!! 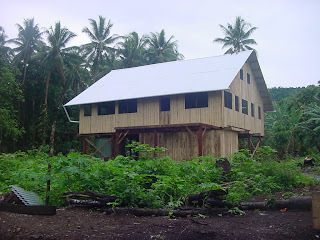 That's a my house!! It was sooooooo cute!! 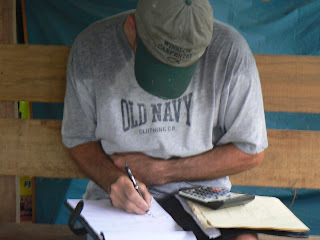 Here is Glenn doing the math for the rafters!! Yeah Glenn!! 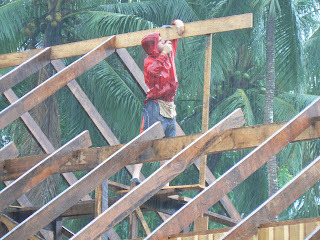 Micah nailing up some of the very heavy rafters in the rain!! 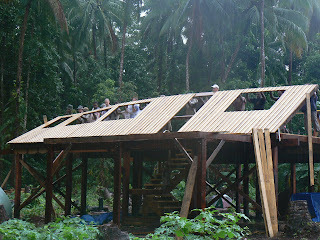 Below that is a shot of the metal roof going on!! We were happy to see the sun!! 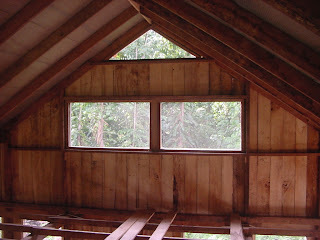 Here is a nice indoor shot of the loft!! Just wonderful!! 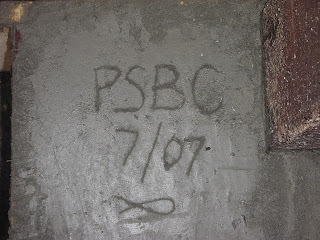 A nice PNG style concrete slab poured by the Park Street Baptist church crew!! 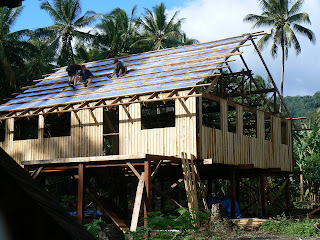 A shot of the house at the end of phase one!! Complete with a mud room below! 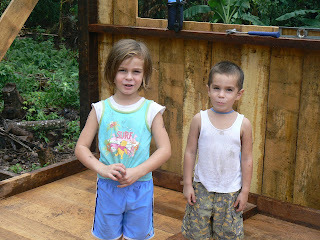 Here are Zoe and Caleb standing in "their room!!" They were very excited!! 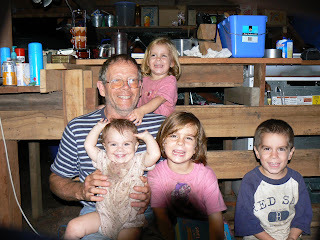 Grampa LOVED spending time with the grandkids!! 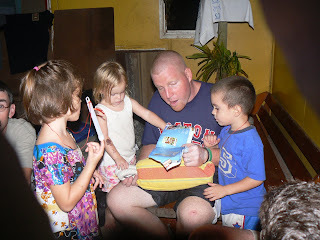 They liked it, too!! The tribe is located right on the ocean!! It's beautiful. We enjoyed many walks along the beach!! Happy Birthday Jonathan PNG style! !